Carstens - Bedding, Shower Curtains and Drapes. 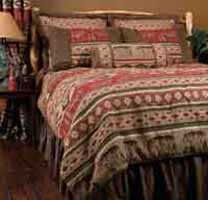 Woven polyester and an acrylic /cotton blend in warm browns and rich reds are crafted into images of strolling bears and moose framed by geometric patterns in our Adirondack Bedding collection. These bed sets include comforter, bedskirt, two Euro shams (twin has one), two standard shams (twin has one, king has two king shams), and one decorative pillow. 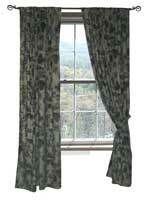 The Adirondack pattern is also available in a matching Shower Curtain and Drapes. Dry cleaning recommended. However, can be Machine Washed Cold, Air Dry. 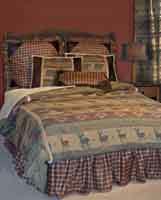 The Heartland Bedding Collection's mélange of woven polyester chenille, microfiber suede, plaid, faux shearling and bullion fringe with a bear and deer motif exudes spirits of the forest. 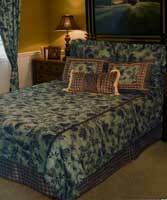 Bed sets include comforter, bedskirt, two Euro shams (twin has one), two shams (twin has one) and one decorative pillow. 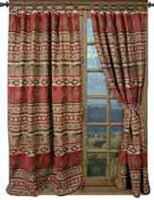 The Heartland pattern is also available in a matching Shower Curtain and Drapes. Dry cleaning recommended. However, can be Machine Washed Cold, Air Dry. 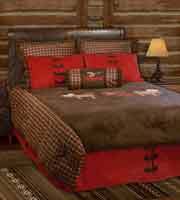 With a pair of moose flanking a red canoe, classic brown and tan plaid, and plush 100% polyester microfiber suede in chocolate brown and bold crimson accented with faux antler buttons and bullion fringe, the Moose Plaid Bedding offers warm, soft lodge appeal. The coordinating tan plaid is also available in a matching Shower Curtain and Drapes. Each bed set includes comforter, bedskirt, two standard shams (twin has one, king has two king shams), two Euro shams (twin has one) and one decorative pillow. The Moose Plaid pattern Dry cleaning recommended. However, can be Machine Washed Cold, Air Dry.